Friday night we had friends over for dinner. They have five daughters, two of which are close to Margaret in age and one is close to Ian in age. They had a great time playing together and started watching Frozen. Our guests had not yet seen it. Unfortunately they started it to late and were not able to finish that night. We ended up having the two that are close to Margaret’s age back on Saturday for a sleep over and they watched it twice. For the adults and the two older girls we stayed upstairs and talked. We also snuck dessert without telling the younger ones. It meant that we got to eat it in peace and quiet. At least until they caught on. It was a lot fun for both the kids and the adults and we need to do it more often. The sleepover was likewise fun. They played outside for a bit and then we had supper. After supper they watched Frozen twice and dressed up like the characters with stuff out of our dress-up box. It the morning we fed them breakfast and took them to church. We attend the same church so that was the most convenient way to return them to their parents. We named our Betta fish Beta Tester. That was my wife’s idea and it has stuck. 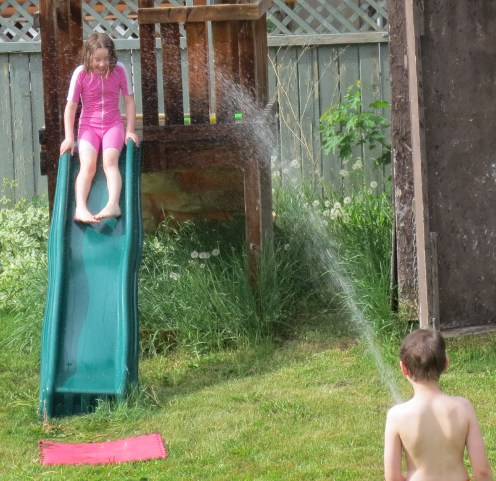 The kids had their first water fight of the year. My wife set a temperature that it had to be before they could so they have been carefully watching the thermometer. 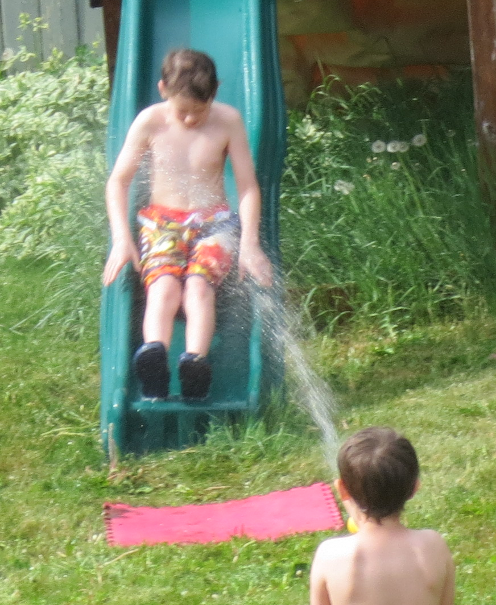 They had a lot of fun and turned the slide into a water slide. They also managed to not track in a muddy mess although Ian was wearing his shoes instead of crocs. 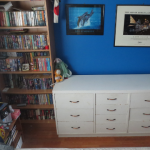 My wife worked on her dresser but that turned out to be at least a two day job. Unfortunately she has not had time for a second day at it. She is going to have another go at it tomorrow. 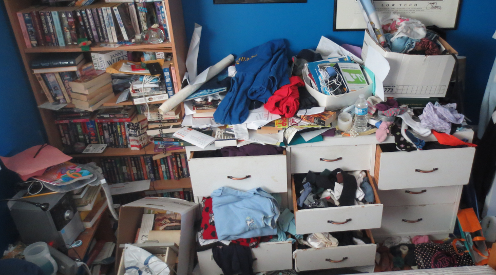 Part of the problem is that some of the stuff that the kids and I have dealt with have ended up on her dresser. Basically anything that is her’s that we didn’t know where to put ended up there. It was already a disaster but we did add stuff to it. She made great progress and I can testify that the top was clean at one point. Then she started sorting the books from the floor. I cleaned out the fridge and out upstairs freezer. The fridge was a disaster but that is really just part of living. The freezer was stuffed full and pulling stuff out was like playing Jenga. A lot of it was unidentifiable or freezer burned. I also really need to make banana bread. When ever there are bananas that are about to go bad we stick them in the freezer skin and all. It works great except I have 20+ frozen bananas and a double batch only calls for six. People have been asking what has been motivating me to do this. The personal reasons will require its own post but the week to week stuff has come from a Babycenter board called “Becoming a Minimalist”. They have weekly challenges that I have been follow along with great advise and the occasionally tough love kick in the behind. We are now two weeks from the kids’ deadline to get all their work done and three weeks from when I have to submit the portfolios. Margaret is still on track Philip I think has finally hit the point where the deadline is applying enough pressure to get results. He will get it done. He always does but he is giving me grey hairs in the process. 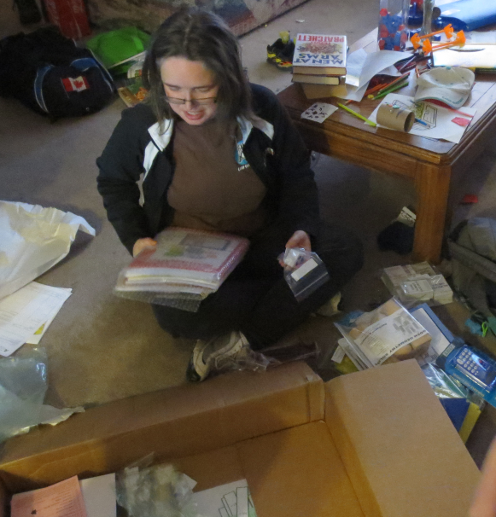 We also had the fun of opening a curriculum box. We had ordered Rightstart Math for Ian for next year and this huge box arrived. The cool thing that we did was play with spectrums again under more controlled conditions. The pictures are taken in my laundry room as it is the only room that I can make totally dark. 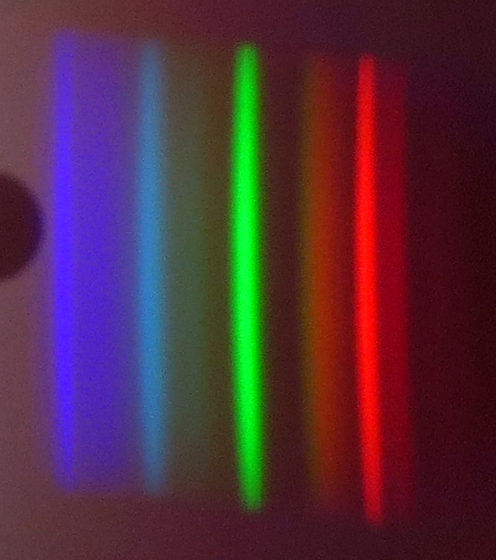 The first is a normal continuous spectrum that come from heating something until it glows. The second is a CFL light bulb. The lines could be used to tell what elements are in there being excited to glow. Margaret decided to get creative with the Kool-Aid. She carefully weighed the tiny 6g package and used the scale to divide two packets into 3g piles. 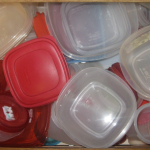 She then mixes the flavors and stored one “packet” in a Ziploc bag and made up the other. One of the things that I think shows the effect that Global Warming is having is the Arctic. There is lots going on up their but the National Snow and Ice Data Center has been tracking the sea ice since 1979. The video shows the losses that we have seen. There is also a graphing page that lets you select various years and two sets of averages. It is interesting to compare the 1979-2000 average with the 1981 to 2010. The 2 standard deviation grey area expands greatly between the two. The yearly lines should be within the grey area 95% time. That is what 2 standard deviations mean. They should also be evenly distributed above and below the average. You have to go back quite a while to find one that is above. I think I saw this on someone’s blog but I can’t remember who’s. YouTube just suggested it as a “Watch this again” video. I really liked it the first time so I thought I would share it. Looks like a really good week. My kiddos give me a new gray hair each day, sometimes it’s them whacking their head to the point where I fear concussion and sometimes it’s their lack of motivation in their lessons. 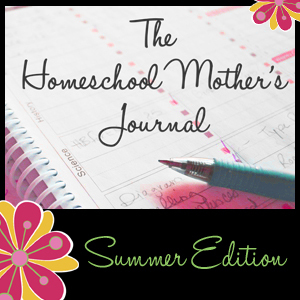 Both states we report to (because we usually live half the year in one and half the year in the other) are really easy going and don’t require state testing or portfolios. BUT next year begins my eldest’s grades and all being tracked so that eventually we’ll get the accredited diploma that he is so set upon. We LOVE Girls Who Read! And I can totally relate to too many frozen bananas!